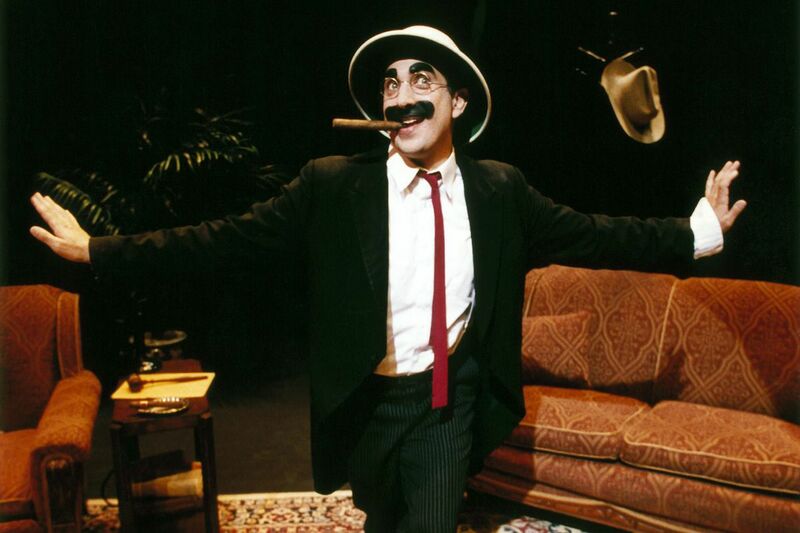 Frank Ferrante as Groucho Marx in “An Evening with Groucho Marx,” through Feb. 25 at the Bucks County Playhouse. If only for preservation's sake, someone like Frank Ferrante, who really inhabits Groucho Marx, physically, vocally, and rhythmically, should always be around. Our species has a permanent need for anarchic, blissfully inappropriate humor; clowning can be cleansing. And An Evening with Groucho, at the Bucks County Playhouse through Feb. 25, a show Ferrante has been doing around the world for 34 years, gives us both the Groucho that history has preserved (the famous gags and stories) and perhaps an even better Groucho, the one history hasn't. The Bucks County Playhouse is the place for this show. Harpo Marx spoke on those boards in 1941, in The Man Who Came to Dinner. George S. Kaufman, who had a writing hand in that play as well as in three Marx Brothers films: The Cocoanuts, Animal Crackers, and the indelible A Night at the Opera, lived for a time in Bucks County. So did S.J. Perelman, a writer on Monkey Business and Horse Feathers. The Marx Brothers worked with some of the most talented comic writers in history, Kaufmann, Perelman, Morrie Ryskind, and songwriters such as Harold Arlen and E.Y. Harburg. The last two wrote "Lydia, the Tattooed Lady," the high point of the show. But Groucho was also an accomplished crowd-worker, and this was the bulk of the show, as Ferrante-as-Groucho clowned with audience members. Groucho: "And where are you from, ma'am?" Response: "What?" Groucho: "This is what public schooling will do to you. [Slowly:] Where are you from, ma'am?" "Bethlehem." "Bethlehem? Jesus Christ!" Groucho declared audience member Mike to have died: "A memorial service will be conducted in the lobby right after the show." To another: "Are you alone?" "Why, yes, I am." "I can see why." He declared two bald men sitting together to be "like an aerial view of Mae West." This is the aspect of the Marx Brothers act that could never be preserved; accounts say their road shows were punctuated by comic raids into the crowd. Groucho's arch, salacious ad libbing served him well as host of You Bet Your Life (the stuffed "secret word" duck was on stage, don't worry). This deep, loving dive into Goucho lore showed this clown at his best. It would work for any audience with a sense of humor, I think. If you are a Marx Brothers fan or want to know what it might have been like to be in the same theater with him (at your own risk), go. As for me, Ferrante had me at "Hello, I Must Be Going." Frank Ferrante in "An Evening with Groucho"
Through Jan. 25 at the Bucks County Playhouse, 70 S. Main St., New Hope, Pa. Tickets: $35-$45. Information: 215-862-2121, bcptheater.org.